One of my favorite movie trilogies is the Back To The Future series. (Yes, I have several favorite movie trilogies. Star Wars, Indiana Jones, Die Hard... And yes, I know they're all not really trilogies anymore. But I digress.) Something that Doc Brown often admonishes Marty McFly is that he's "not thinking fourth-dimensionally." Though we haven't broken through that fourth dimension of time yet, I find that I'm often guilty of not thinking three-dimensionally. When you're living in a small space, you can't forget to think UP! Here's a trick to consider for the bathroom: use a set of hanging baskets (traditionally found in the kitchen) as storage above your sink. Wouldn't this basket from Target look cute with rolled towels, bottles of toiletries, or even a box of tissues in it? And at about $13, it's not even out of MY budget! Remember, you have to think THREE-dimensionally (and get the Delorean up to 88 miles an hour)! Via Target.com. To thank you for this brilliant tip, I have a red puffy vest for you. I love these baskets! Thats sooo true... I never think up! ESPECIALLY with lighting!! Anonymous (Sasha): Thanks! Can I have a hoverboard too? Elena: I think a problem we renters run into is that it's hard to install wall-mounted lighting without totally sacrificing your security deposit. But it's a good idea, and I'll try and research ways to bring your lighting up off the floor in a way that's rental-friendly. Love this idea! 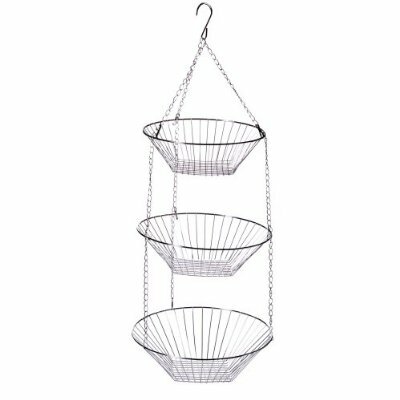 I got ambitious a while back and bought 2 of these hanging baskets, thinking we would could keep all kinds of fruit and such in it. And, of course, I only put one up. But finally I think the other will go in the bathroom. I am not a cat lady, I am a cat WOMAN. I don't do one nightstands. At least I'm not wearing oversized sunglasses. West Elm contest at Decor8!